Ayya Santussika is also available to make a short presentation at your group. Contact us! Of course for light rain, we can just use umbrellas, so we hope you can bring one. If the rain is heavy, we can take bus #1 that stops just outside of Gold Mountain Monastery to Sacramento & Octavia and walk for 2 blocks down Octavia to the Buddhist Church of SF on Pine and Octavia. The bus ride is $1.00 for ages 5-17. For anyone age 15-17, they may ask for an ID. The fare is $2.25 for adults. Bus #1 comes every 7-8 minutes. If it is still raining hard when we are ready to leave the Buddhist Church and go to the Vietnamese temple at 243 Duboce, we can either walk for 30 minutes straight down Laguna in the rain or we can take the #49 bus from Sutter and Van Ness to 150 Otis St, in which case there is an 8-minute walk on each end. This year we will end the Walk at the Vietnamese temple. If we ride within 90 minutes of our first bus, we won't have to pay anything for the second bus. On Saturday, October 15, 2016, we will once again tour Buddhist temples in San Francisco as we raise money for the poor and hungry around the world. As with last year, in honor of this worthy cause, Mayor Ed Lee has declared it Walk to Feed the Hungry Day in San Francisco. To learn about the projects that Buddhist Global Relief makes possible, visit www.buddhistglobalrelief.org. ​San Francisco has a rich Buddhist history. There will be opportunities to see beautiful shrines as well as beautiful views as we visit some of the city’s highlights. Of course, the greatest opportunity of all is to express our compassion through helping the poorest of the poor around the globe. People are encouraged to depart at any point if needed during the walk. Everyone is encouraged to set a personal intention before walking, and those who wish to walk mindfully in silence may do so but it is not required. It will be a time for practice, mindful walking, spreading loving kindness, making spiritual friends, and exercise. It will be a pilgrimage of harmony amongst many as we visit the locations of such meditation groups as: Gold Mountain Monastery, Buddhist Church of SF (where we will pay respects to the Buddha's relics), and the Vietnamese Buddhist Association of SF. Each year BGR awards part of the walk proceeds to a local charitable organization with a mission similar to BGR's. This year the proceeds go to City Slicker Farms who organizes and empowers low-income communities to achieve equal access to fresh, healthy food by creating high-yield urban farms and backyard gardens. Through this process they restore neighborhoods through community building and environmental stewardship. Many groups will help support the Walk such as: City of 10,000 Buddhas, Berkeley Buddhist Monastery, Institute for World Religions, Dharma Realm Buddhist University, Aloka Vihara of Placerville, Dhammadharini Monastery of Penngrove and Karuna Buddhist Vihara of Mountain View. Please bring a water bottle, sun-hat, and whatever you need for your walk (SF is cooler than one assumes). If you can, please wear a white shirt so on the busy streets of San Francisco we can be identified as a group. Getting there: Public transportation and carpooling are encouraged. Getting back to your car: You can walk back or use public transportation. Register for the Walk: You can register at FirstGiving. Register for the Walk and Fundraise: After registering with FirstGiving, participants have the option to create their own fundraising page where they can enlist the support of friends and family. 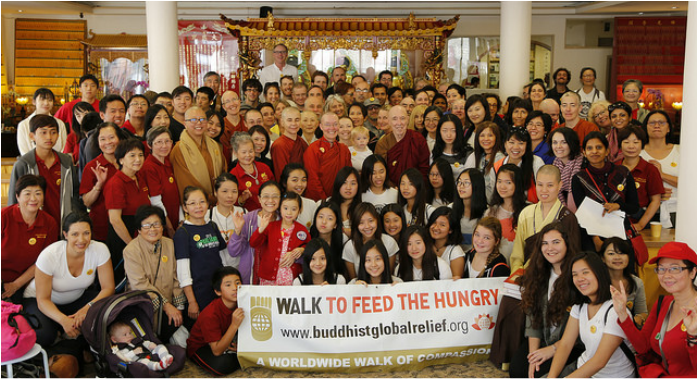 3. donate online at FirstGiving or directly to Buddhist Global Relief in support of the San Francisco walk​. Go to the Buddhist Global Relief website for more information about their projects and activities. Buddhist Global Relief is a 501(c)(3) tax-exempt organization.